The Ten Commandments are not called that in Scripture. Rather they are called “The Ten Words,” and they are the core of the Covenant Code, the compact Hashem made with our people at Sinai. The Ten Words are useful in so many ways. Even though they are of course primarily designed to be the basic structure for Israel’s covenant with Hashem, today I want to suggest we consider how they can form the substructure of our individual living, if we would walk with the Holy One. It seems to me that at their root, the Ten Words may be seen to be all about making the Holy One to be our fundamental point of reference, our Absolute. With this in view, consider making these Ten Words the core of your own covenant relationship with God. 1. “I am the Lord your God . . . “ Always make sure that the Holy One is your ultimate Absolute, the axis around which everything else revolves, the root of all your values and decisions. His right to be such is due to His being creator, rescuer, provider, protector. Why did God introduce himself as the Power who brought the Children of Israel out of Egypt, rather than as the Creator of the universe? Was not the creation of the world a much greater miracle than the Exodus? Ibn Ezra answers that unlike creation, which no one ever witnessed and no one could truly understand, the Exodus was an event which an entire generation had experienced in its own lifetime. People who do not believe in a personal God will identify God with a blind force that takes no hand in human affairs. But anyone who was witnessed the historical fact of the Exodus would be so overwhelmed by the miracle he saw before his own eyes that he will be forced, as it were, to believe in a personal God who guides the destinies of man (The Mitzvot: The Commandments and Their Rationale). 2. No graven image: do not reduce the Holy One to your own size. He is greater, He is other. The word most appropriately used is “holy” (kadosh). He is truly incomparable, and in our parlance, he is the Highest. So don’t reduce God to the stature of your preferences, or even your best imaginings. He is not only more that all that—he is Other. Again, we are reminded that God is our ultimate Absolute. I am God, and there is none like me. . .
“To Israel the unique events of historic time were spiritually more significant than the repetitive processes in the cycle of nature, even though physical sustenance depended on the latter. 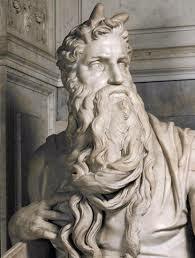 While the deities of other peoples were associated with places or things [or cycles of nature], the God of Israel was the God of events: the Redeemer from slavery, the Revealer of the Torah, manifesting Himself in events of history rather than in things or places. Thus, the faith in the unembodied, in the unimaginable [non-spatial] was born” [Abraham Joshua Heschel, The Sabbath: Its Meaning for Modern Man]. 3. Not taking the name of Hashem in vain: Using God’s Name in a utilitarian and self-serving fashion only tends to cheapen it, and to bring Him down to our level. Yeshua said, “Our Father, who art in heaven, may your name be treated as holy.” That means we must beware of any tendency to bring God down to the level of our own puny perspectives and agendas, to use him as a tool for making our own way in the world. It doesn’t work like that! Think of God as always higher—exalt his Name. Again, we are reminded that God is our ultimate Absolute. 4. Keep shabbat holy as a remembrance that you are no longer to think of yourself as a wage slave or as at the full disposal of someone or something else that overrules or pushes to the side your allegiance to God. Shabbat is a time to remember that you are his, that your time is his, that your life is his, and that all you know and experience exists because of his kindness and goodness. Do not make your work your absolute, and in the words of the Apostle Paul, “You were bought with a price: therefore, glorify God in your body and do not become a slave of others” (1 Cor 6, 7). Again, we are reminded that God is our ultimate Absolute. 5. Human ethics begins at home – Honor your father and mother. The person you will be in the outside world will be a reflection of who you are with your family. Contempt for human authority begins with contemptuous treatment of one’s parents, and goes hand in hand with contempt for the Holy One. Those who treat human authority with contempt are treating their own desires and sense of empowerment as absolute. Again, we are reminded that God is our ultimate Absolute. In a few chapters we will read these harsh words: “Anyone who curses his mother or father shall be put to death” [Ex 21:17]. This was never carried out by the way, but this language is what I term “limit language.” It is a strong way indicating what kinds of things just don’t go. In view of what we have been discussing here, why do you think this commandment was put in the Bible for the Israelites to follow? 7. Do not commit adultery – Do not cross over God’s appointed sexual boundaries making your own pleasure your absolute. Again, we are reminded that God is our ultimate Absolute. 8. Do not steal – making things your absolutes. Again, we are reminded that God is our ultimate Absolute. I happened to turn on an episode of “Hoarders” the other night, about people whose entire lives become unmanageable, their human relationships unsustainable, because they become hoarders with their houses crammed from floor to ceiling with every doodad they ever bought or obtained. Question: What might hoarding have to do with idolatry? I know people who prefer to limit God’s will for us to the Ten Commandments. I believe this is largely because we prefer generalities to specifics, because it gives us a lot more wiggle-room, and feels so much more convenient. However, I don’t think Torah lets us off so easy. Not only can it be inferred that the Ten Words are the principles and assumptions underlying all the rest of God’s Law for Israel, it is also explicitly stated in in the Bible that the Ten Words were emphatically NOT all that God had to say to Israel which he wanted then to obey. This is why Devarim/Deuteronomy 4:13-14 says this: “13 He proclaimed his covenant to you, which he ordered you to obey, the Ten Words; and he wrote them on two stone tablets. 14 At that time ADONAI ordered me to teach you laws and rulings, so that you would live by them in the land you are entering in order to take possession of it.” In the very same context in which the Ten Words are mentioned, we are reminded that these are not God’s final words of command to us! And the LORD said to Moses, “Thus you shall say to the people of Israel: ‘You have seen for yourselves that I have talked with you from heaven. You shall not make gods of silver to be with me, nor shall you make for yourselves gods of gold. What do you notice here that comports with what we read in this blog? An altar of earth you shall make for me and sacrifice on it your burnt offerings and your peace offerings, your sheep and your oxen. In every place where I cause my name to be remembered I will come to you and bless you. If you make me an altar of stone, you shall not build it of hewn stones, for if you wield your tool on it you profane it. In view of what we have been examining, why was it crucial to use unhewn stones to build God’s altar. What’s the message here? Other nations in the area didn’t bother with this nicety. Why the difference? An illustration of all of this in a note I just received last night from a marvelous friend, who travels and ministers widely in the Two-Thirds world, helping poor people wherever he goes. His name is Fletcher Tink. Here is what he said in his recent Facebook post. So sad to hear about the suicide death of L’Wren Scott, fashion designer and long term girlfriend of rocker Mick Jagger. Why do I care? Because she is one of so many, with apparent success, fame and resource, trapped by the world’s values without a seeming way out. I see so much Hope out there even for those less advantaged, such as those around me in Pakistan who despite great odds, find meaning in the simple things and strivings of life. But I also feel a personal connection. In October 2011, I rode on the same four hour tourist train from Machu Picchu to Cuzco, Peru with Mick Jagger, his girlfriend and son. No, I did not meet them. They were in a private carriage (rented for $3,500) directly in front of ours, with a side balcony where they stood out to watch the gorgeous scenery. I sat in the first seat by the right window and watched them closely while the paparazzi tumbled over themselves all around me trying to get photos, and then when they disembarked at a private stop just before the Cuzco station. They saw the ruins in the early foggy, rainy morning prior to public entrance. I visited the ruins in the sumptuous brilliance of the sun. But despite the fame, the darkness and fog envelope so many of these creative and talented icons. I wonder what Jagger is thinking today, and my sympathies and prayers go out to him. Fame can never compensate for God’s presence in one’s life.—that’s where one finds “satisfaction”.